Rosewood insane asylum was built in 1888 with the purpose of being an Asylum and training school for the feeble minded. Things were obviously a little different in the day and official statements would now be considered a little bit, shall we say politically incorrect. The Maryland legislature read the following regarding the hospitals purpose. “An Act to establish and incorporate an Asylum and Training School for the Feeble Minded of the State of Maryland” (Chapter 183, Acts of 1888) which empowered a seventeen member Board of Visitors to direct the selection of a site for a school which "shall receive, care for and educate all idiotic, imbecile and feeble-minded persons". The building was always relatively low funded from the start and this was reflected on to the patients in the form of low staffing and insufficient care. The building went through a number of changes and reached a point in the 1940's were it was particularly over crowded. 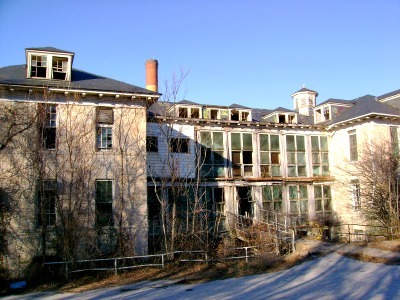 The building struggled through operating as an asylum until in 1981 it was investigated for reports of malpractice and abuse. There reports turned out to be confirmed and the building was condemned in 1989. Since then two of the buildings on the grounds have burned down and the site is now the property of Stevenson University. As you can expect the medical treatments in the day weren't exactly the most effective and often certainly not the right course of action for the patients well being. The hospital was very often over crowded and at times was so full people had to share single rooms and the amount of care patients received was drastically decreased. This as you can expect led to many deaths within the asylums walls, with patients often suffering greatly in their last days. The hospital was also forced to expand a burial area on its grounds during the flu epidemic when it lost a huge number of its patients. The typical reason spirits remain in an area is often when they suffered greatly in their last moments or have unfinished business in this world, and there was certainly a lot of suffering that went on within the asylum. Before the two buildings were burnt down there were sightings of apparitions of patients within them, which often seemed to be stuck in some kind of time loop, were they would be seen walking the same path before disappearing. Orbs are particularly common in photos of the buildings and around the grounds, and the burial area is a common place to feel the presence of an unseen individual. Other than that evps have be captured in the still standing buildings and the faint sounds of moans coming from patients rooms sometimes echo quietly through the empty corridors. If you wish to visit the site please contact the current owners of the lands and receive permission as the area is private property.